'Millions of years ago, there was a twin planet to Earth...' The year is 1986, and at the South Pole the crew of the Snowcap Base have detected a new planet on their radar. The arrival of the Doctor, Ben and Polly at the Base coincides with another landing - that of a spaceship whose humanoid passengers have used cybernetics to replace their limbs and vital organs. The new arrival in the solar system is in fact a tenth planet, and Earth's twin. Its return has brought with it the emotionless Cybermen, their sole aim to ensure the survival of their race. To this end they plan to drain Earth's energy into the dying Mondas, whilst using the human population as fodder for a continuing programme of cyber-conversion. Battling alongside the humans to save their planet, the Doctor appears to weaken and age before the eyes of his companions. An ultimate collapse appears to signal his death - but then... 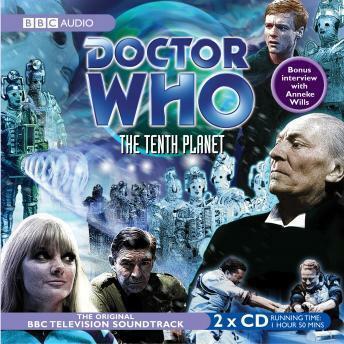 In an exclusive bonus interview, Anneke Wills - who also narrates the story's soundtrack - recalls her memories of making The Tenth Planet.